Virtual Systems Midnight, releases its new wide format printer. Building on their powerful web-based software for printers and mailers, the Virtual Systems team is pleased to announce the release of two distinct new tools for wide format printers in their flagship product, Midnight. 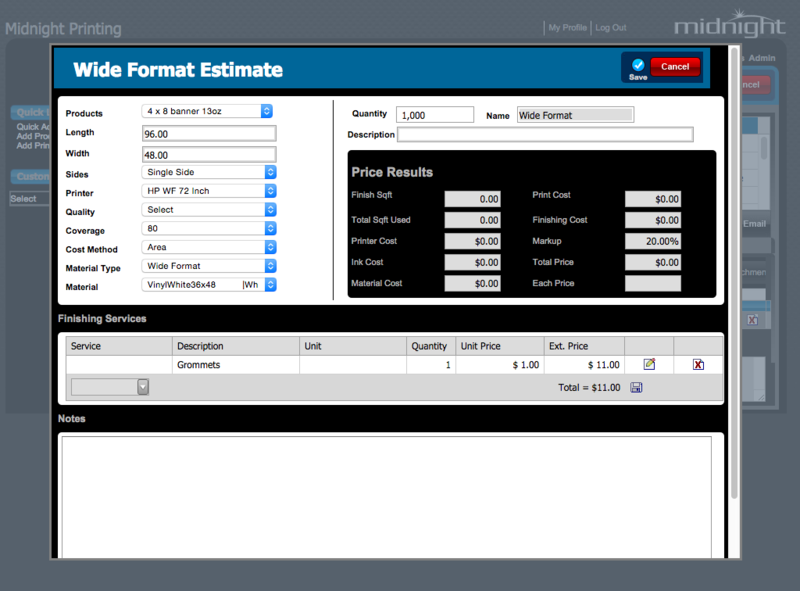 With the addition of the Cost Plus and Square Foot Matrix tools, wide format printers are now able to estimate and invoice jobs with a streamlined user interface that minimizes up-front work and allows invoices to be created with less time and hassle than ever before. For more information on Midnight, Virtual Systems’ web based product for printers, mailers, and wide format shops visit http://www.virtualsystems.com. Virtual Systems makes web-based management software for the print, mail, and fulfillment industry. Our powerful, innovative and easy-to-use software solutions serve hundreds of companies and thousands of users.